Broad-spectrum antihelmintic drug for dogs and cats. Plain tablets with a scoreline on one side and logo (a cross in the center of shield) on another. 6 tablets in blister pack. Outer package - carton. One active ingredient provides broad-spectrum antihelmintic action. Acceptable for pregnant and lactating females. 1 tablet contains fenbendazole - 0.15 g (as an active ingredient), as well as excipients. Fenbendazole action (a component of the drug) has broad-spectrum nematodocidic and cestodocidic effect on adult stages, larvas and eggs of roundworms in gastrointestinal tract and lungs, as well as on cestodes parasitizing animals. The mechanism of fenbendazole action involves destruction of microtubules in worm intestinal cells and disorder of energy processes causing death of parasites. Use Febtal for treatment and prevention of various nematodoses and cestodiases in dogs and cats (including toxocarosis, toxascaridosis, ankylostomosis, uncinariosis, dipylidiasis, taeniidosis). Do not use in debilitated and contagious animals, as well as in puppies and kittens under 3 weeks old. 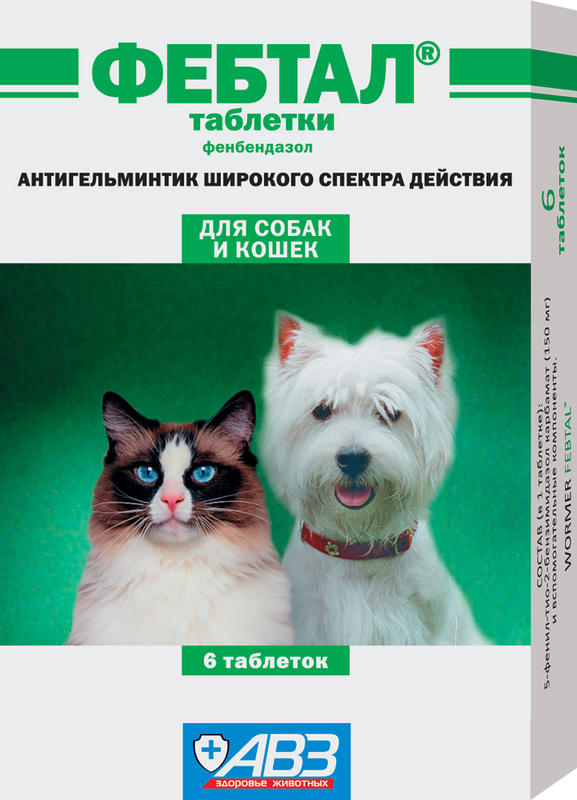 • Adult dogs and cats - 1 tablet per 1.5 kg of body weight. • Puppies and kittens (above 3 weeks old) - once a day in a single dose (1 tablet per 3 kg of body weight) for three days in succession. Adverse events and complications are not observed in case of administration as per package insert. Stop drug administration in case of increased individual sensitivity to fenbendazole and allergic reactions. Overdose symptoms are not detected in animals. Protect from light and moisture. Keep out of the reach of children and animals. Store separately from food and animal feeding at 0-25°С.